The story dates back to the early 1930’s when as a young boy, Hans Mickeleit watched fish being smoked at his homeport of Swinemunde, Poland. Later in 1939, Hans boarded a freighter bound for Japan but was detained in Durban when World War II was declared. At the end of the war he decided to visit Cape Town where he fell in love with the port village of Hout Bay and immediately arranged for his family to emigrate. Hans’s purchased an old bus, which he converted into a takeaway cafe and positioned it at the end of Harbour Road, Hout Bay. They named the take-away cafe, Snoekies from where they served fish & chips to the local fishermen. Hans’s wife ran the Snoekies take-away cafe whilst he experimented with smoking fish and they found that his smoked snoek sold well at the café. Before long they found it difficult to keep up with the demand from their garage at home and in 1956 he built a factory in the Hout Bay Harbour. In 1959 the business, together with Hans’s secret for smoking fish, was sold to South African Sea Products under their Oceana division. More than 60 years since it’s humble beginnings, the custodianship of the Snoekies Brand has been placed on the shoulders of entrepreneurs David Aronson & Justin Strong. Today you will still find Snoekies situated at the far end of Hout Bay Harbour, continuing to provide locals and tourists with light, crispy-golden battered hake and freshly-cut chips from the Snoekies take-away as well as fresh fish from the Snoekies Fish Market. 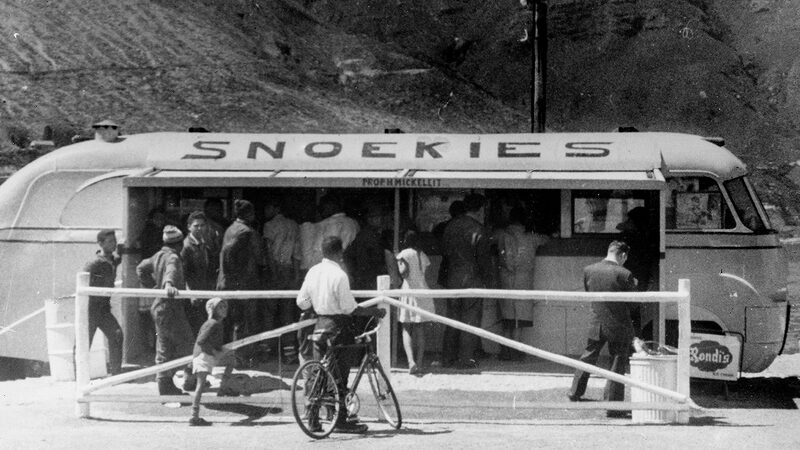 Snoekies old bus, converted into a takeaway cafe and positioned it at the end of Harbour Road, Hout Bay (c.1951). Menu offering & prices subject to change without notice. * Sinnfull® Ice Cream available at selected branches only. Find your local Snoekies restaurant! Please fill in our form if you wish to contact us.